The November 20-edition of Dutch newspaper Metro featured a comic strip in which Dutch cartoonist Aimée de Jongh displays both her intellect and sense of ‘satire’ by comparing the crashing of a boat full of Zwarte Pieten (Black Petes) to the Lampedusa tragedy. The Sinterklaas mentioned in the first frame is a Santa Claus-esque figure who, together with his Zwarte Pieten (an army of Black servants who’re all called Zwarte Piet and who’re portrayed by white people with blackface, afro wigs and Moorish outfits) brings presents to the kids in Holland. This Zwarte Piet-figure has faced opposition for more than 60 years but since October 2013 the displays of Dutch anti-Black racism have become extremely violent and gained more international attention than ever before. The Italian island of Lampedusa made worldwide headlines when on October 3 of this year, more than 360 people died when the “migrant boat” that was taking them from Libya to Italy sank not too far from the Lampedusan shore. Posted on November 20, 2013, in #UndocumentedNL, Anti-Blackness, DecolonizeComfort. Bookmark the permalink. 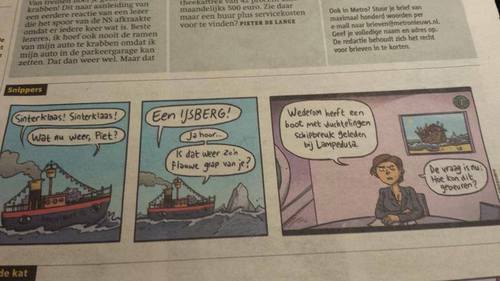 Comments Off on Dutch cartoonist mocks both anti-Black racism and the Lampedusa tragedy in one comic strip.